A parent feels some frustration over a child’s progress in the minority language (or languages). The parent shares this frustration in a new thread at The Bilingual Zoo. The “keepers” of our community respond with suggestions and support to help fortify and fuel the parent’s efforts. The parent makes more mindful and proactive efforts, persisting past the initial discouragement. Over time, the child exhibits stronger language development. The parent returns to The Bilingual Zoo to share this more satisfying progress. Stronger efforts, over time, lead to stronger progress. As much as I sympathize with such feelings of frustration, I also must respond with a healthy dose of “tough love” because getting stuck in discouragement is shortsighted and unnecessary—as the success stories at The Bilingual Zoo plainly demonstrate. Since language ability is never an all-or-nothing proposition—language ability exists on a broad continuum of proficiency—as long as you continue making the most effective efforts you can, your child will continue making progress and moving forward on this continuum toward stronger language ability. How well can you take on your frustrations with a positive spirit and a longer-range perspective, converting these potentially destructive feelings into productive energy and more effective efforts? How clearly can you see that your frustrations are actually useful to your success because they point to the problems that must be addressed more mindfully, more proactively, in order to produce the more satisfying outcome you seek? When all is said and done, success on the bilingual journey is largely a matter of perseverance. If you persevere past your frustrations, while continuously fortifying your efforts as best you can (and I hope my many resources can help! ), you will surely experience the same kind of rewarding progress shared by parents at The Bilingual Zoo. As their examples show, the frustrations that serve as useful motivation for generating stronger efforts and greater success ultimately become, from a longer-term perspective, short-lived footnotes to the larger story of their bilingual quest. …and continue plodding forward—step by step, day by day—with as much patient and playful (and zombie-like) determination as you can muster. There’s always a payoff to perseverance! 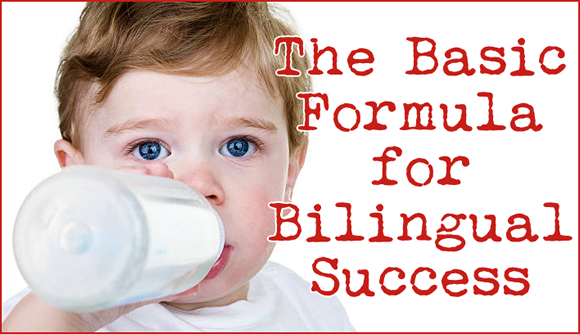 Explore all my resources for maximizing success and joy on the bilingual journey! How about you? How do you respond to frustrations? Could you respond even more positively? Another great and inspiring post Adam; thank you! Definitely is the the basic formula. Amy, I appreciate your kind comment. I’m glad this post spoke to you.